Growing up in France, Jacques Cousteau always loved the water. He loved knowing how things worked and he dreamed of flying through the air. As Cousteau grew up, he discovered a love of movies, too. He bought a movie camera and began to film the world around him. When a friend gave Jacques some goggles and he saw the underwater world clearly for the first time, Jacques's life was changed forever. He dedicated his life to exploring the sea and bringing this beautiful, silent world to others with his films. 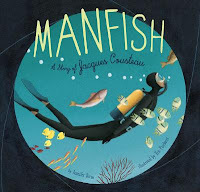 Really gorgeous paintings illustrate this picture book biography of Jacques Cousteau. As Jacques discovers the sea, the reader sees all the wonderful plants and animals, too. As he dives deeper and deeper, we're treated to vertical spreads and unfolding pages that really capture the underwater wonderland that he explored. One page near the end of the book depicts the pollution that horrified Cousteau and lead him to speak out in favor of protecting the ocean and its creatures. The last page is a call to future generations to explore new worlds and help protect them. A short author's note gives a little information about the author's inspiration and some ideas for further exploring the world of Jacques Cousteau. Hand this one to aspiring marine biologists and fans of picture book biographies like Surfer of the Century by Ellie Crow and Richard Waldrep. Also check out reviews at Shelf Elf and The Well-Read Child! And, of course, make sure you check out the Non-Fiction Monday roundup at Picture Book of the Day.